When we decided to move to the Netherlands, we had a list of places we wanted to visit. Zakopane, Poland was not on that list. We had never even heard of it before. I was doing some research for our November trip, when I saw a photo from a Facebook group I am in called Girls Love Travel. The picture was unreal. 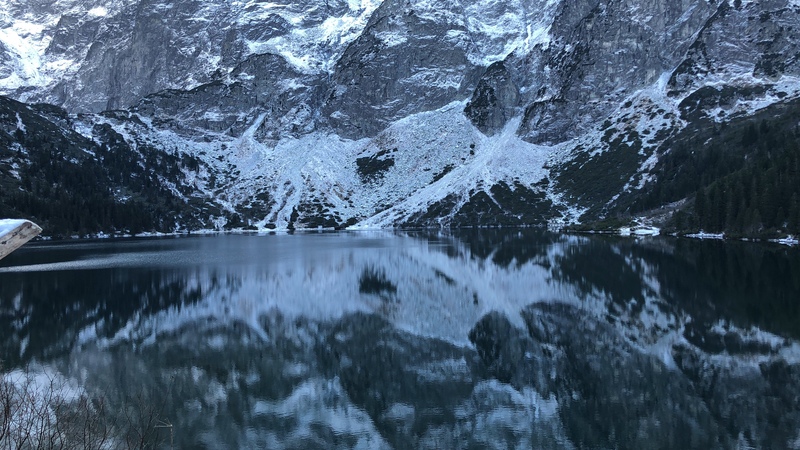 I learned that the photo was a place called Morskie Oko, near Zakopane. In the photo, you could not tell where the mountains ended, and the water began. I knew I had to see this place in person. I knew that it was just what our family needed. Something different. Somewhere that wasn’t a big city. If you read my last blog post, we are experiencing a season in our family where the hustle and bustle of well-known destinations aren’t working for us right now. We needed to get away, to turn off the TVs and computers. To spend time together. Really together. We were all so excited. If you have been following our adventures you know it starts at the airport. I was determined that this time would be smooth, I tend to think I have control over everything, HA! After having lunch (next to our gate) I needed to run somewhere. I ask Rob and Z to stay put. I would be right back. Fifteen minutes later I returned to the table where I left them and it was empty. Rob, Z and all of our stuff was gone. I walked over to the gate they were not there. I know what your thinking, just call them. My phone was in my coat pocket, which Rob had. We had about an hour before boarding. So I decided they must have gone to get me, so I will just wait at the gate. After 20 minutes or so panic started to set in. In the Schiphol airport, they have payphone kiosks. After several failed attempts at using these pay phones, I decided I was going to go find them. I went back to where I told them I was going, eyes wide open looking for them along the way. I now realised we had about 30 min before boarding. Rob is VERY specific about being at the gate by then, so we don’t even come close to missing the flight. I took a deep breath and tried to calm down as I headed back to the gate. I decided if they were not there I would have the KLM desk call them. I found it odd that there was no one at the desk. At this point we have 15 min until boarding. I felt like the airport was spinning, then I realized It was me who was spinning figuratively and literally. I finally look up and see our gate now says Stockholm. Weird, that’s not where we are going. I finally realize our gate had changed. I stop thinking and take off running. I have 15 minutes to get from C12 to D38! If you don’t know Schiphol Airport, it was one end to another and the airport was very crowded. I made it with a few minutes to spare! When going to Zakopane, you fly into Krakow, take a cab about 45 minutes to the bus stop, find a bus that says Zakopane on it, then, ride for two-three hours to your stop. The bus was very clean and comfortable, thank GOD! We arrived well after the sun went down. We were exhausted, and just wanted to drop our stuff at our apartment and find a hot meal. It was freezing! After checking, in we learned that most places were closed. I mean I know I picked a small mountain town in Poland, but it’s Friday night! After walking around for a bit, not knowing where we were heading or where anything was, we decided we would go to the Grocery shop we saw back near our apartment. You have not been grocery shopping until you have been in Zakopane. Imagine Costco or Sam’s club on a much, much smaller scale, Things were just piled up on top of everything else. Things that don’t even make sense, like toys beside the mustard. We decided to keep it easy, and get a frozen pizza and stuff for sandwiches. After getting back to the apartment we realize there is no oven. I don’t know if you have ever tried to microwave a frozen pizza, but take it from me, don’t do it. Thank God we had sandwich stuff as a backup. When we woke up in the morning, I walked out on our balcony and my breath was taken away. Partially because it was about 30 degrees out, but mostly because of the beautiful snow-capped mountain I was staring at. As we walked to breakfast, which was provided by the apartment company; I was blown away at how big the mountains were that towered over this small town. It was like a movie I had seen before. We decided we were going to do Morskie Oko the first day and Kasprowy the next day. The first thing we needed was hiking boots. We had waited to get them because once you are there, Zakopane is very inexpensive. We paid 250 zloty (50 euro) for Rob’s and my boots. Seriously everything is so affordable. We headed to the bus stop to get to Morskie Oko. We thought we had missed the bus and the next one wasn’t until 1. What you need to know is that it’s a 45-minute bus ride to get to the foot of the mountain then 2-hour hike, at least, to the top. So we thought we would try again very early the next morning so we could still do both Mountains that we wanted to see. As we were walking back towards town, a bus was coming toward us with MORSKIE OKO on it. Rob waved his hand and the very sweet driver stopped and let us on. It was a full bus so we stood in the aisle the whole way there. It wasn’t too bad and people didn’t mind. It was like they were all happy for us for catching a bus. Once you get to the bottom you can choose to hike or take a horse and carriage. I was against taking the horses. I would never even do the horse and carriage tours around Charleston. I was kind of arguing with Rob and Z about why we could not take the carriage when a man who was from Poland came over and informed us that with a small kid it would easily take three hours AT LEAST to get to the top and another Three back down. The last bus left at 6 to head back to town and it was now 11:30. I lost the argument. In about an hour we arrived at the restaurant that is a little over halfway which is where the horses stop and you hike the rest of the way, about two kilometers. It was much colder than it was a the bottom, so it was a good idea to get a hot chocolate and a beer. Then we were off. Rob and I noticed that people walking back down were smiling and laughing. We wondered what was awaiting us. An hour later we see this building, that looked like a cabin. I was so excited to see what the photos I saw on FB were all about. As we walk up the final hill we all stopped in awe. It was incredible. I had never seen such natural beauty in my life. We walked down to the lake and the Mountain really did just bleed right into the water. I remember the look on Z’s face when he said “Woah, mommy do see this?! It’s beautiful!” We took it all in. The cabin is actually another restaurant so we decided to enjoy this amazing view with more hot chocolate, beer, and warm apple pie. I was pretty sure I was in Heaven. Nothing could ever top this. From us to you, Morskie Oko! Who said only leave footprints when there’s snow involved? As we walked back down, we understood why everyone was so happy. We practically skipped back down. I just kept saying “wow I can’t believe we just experienced that!” followed by Rob and Z just saying “I know, I know” We were elated. When we returned to town, it was time for dinner. So we head over to Krupowki street, a quaint, charming, pedestrian street. The only plan was to stroll along and find somewhere that smelled amazing. We found this traditional Polish restaurant that was so good! We got a table right by the fireplace. I was falling in love with Zakopane. Our last day, we reserved tickets to go up to Kasprowy Mountain at 2 PM, so we had time to kill. We decided we wanted to check out Krupowki in the light of day. I am so glad we did. It’s even more charming. There are creeks that run all through the town. We walked down to where we were the night before, and realized it kept going. If you are ever there make sure it’s on a Sunday. At the end of the street, it opens up to a market that is incredible. We go to markets everywhere we have been, but, nothing like this. It was so open and stalls for hundreds of meters. There is a polish cheese you must get while there. It is a sheep cheese that they do not export anywhere. You can have it warm, with the cranberry sauce that is homemade and sold at the many cheese stalls. We got some to share with everyone at the Friendsgiving we hosted and it was a hit! There were clothes, jewelry, gloves, and winter jackets all made locally! Also, at every corner is someone selling hot chocolate, the best Mulled Wine I have ever had, and a polish drink that consists of hot beer with a raspberry syrup (not my thing, but everyone was drinking it). Finally, it was time to head to our next mountain. First, you take a gondola half way up, then get on another gondola to go to the top. When we reached the top, and walked out of the gondola, it was a wintery dreamland! Here we were, standing on top of the snow-capped mountain we could see from our balcony! Once we finished taking in the view, we took some stairs that led to an weather observatory and noticed that people were hiking to the peak of the mountain in the distance. Of course, Rob looks at me and says “c’mon!” He must be crazy if he thinks I am going to go to the very top and take our 4-year-old son with us! This is where my husband and son gang up on me and say they are going. So now, I have to face my fear and go. As we near the top, thick clouds move in and, we can not see more than a foot in front of us. If Z had run off, we’d have never found him again! While we stood at the peak of the mountain, a random guy literally appeared from the side of the mountain. Him and his friends had been hiking and sleeping on the mountains for several days “but it was starting to get too cold” he says. It was -5℃ (28℉). As we stood and chatted with the brave albeit crazy man, we realized just as fast as the clouds rolled, in they were gone, and we were left standing at the top of this mountain. We did it! All three of us. We just stood there in silence (yes, even Z was speechless). I didn’t think anything could top the day before at Morskie Oko. Not that this had topped it, it was just different. I felt so small standing there, staring out at the massive landscape of mountains, but also larger than life because I did it. I conquered my fear of heights and it was amazing. Heading back down to the gondola station, is a restaurant, so again we decided to reward ourselves with a hot chocolate, beer, and a snack. As we are sitting there a man next to us, asks where we are from. When we tell him we moved from Charleston, South Carolina he could not believe it. He was there with his parents and his daughter. They were visiting his parents who are from there. He and his daughter are from Mount Pleasant, South Carolina. He works at MUSC in Charleston. It blew my mind, standing up on the peak of Kasprowy thinking what a vast world this is, to twenty minutes later having a conversation with someone who lives where we are from. We hung outside while our kids made snow angels, he told us all about Zakopane and how the Pope comes skiing here. Sometimes this vast world is so small. I told Rob the only thing that would make this day more perfect if there was snow when we got to the foot of the mountain. As we rode the gondola back down you could see Zakopane covered in a blanket of snow. We headed to Dinner with snow falling all around us. It was magical. If I could change anything about this trip it would have been to have one more day. If you haven’t been, Zakopane should be the top of your travel bucket list. I feel like getting away from the city, not having great internet or TV, doing something like hiking to the peak of a snow-capped mountain really made our little family closer. I look at Z in a new way now. He handled himself very well on that mountain. He had a maturity about him that I had never seen before. I know we all learned something about each other and ourselves. 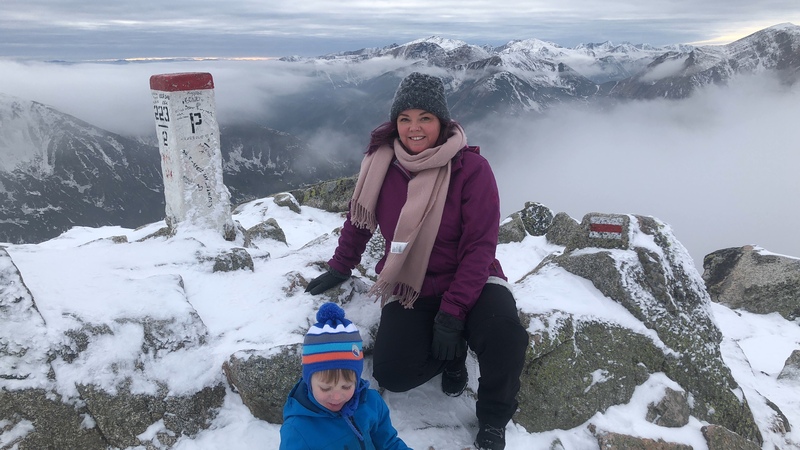 Thank you, Zakopane for bringing our Family closer together and showing us what it means to feel on top of the world. Love reading your posts! Also love the pic of you and Z lying in the snow.